When it comes to playing a hand-built Fence Bass and recording it live, there aren’t hard and fast rules or techniques you have to follow. But musician, composer, and sound designer Diego Stocco can certainly make the mysterious timbres of his exotic instruments into evocative atmospheres. In “Dustland,” the performance and effects are all recorded live – no edits after the fact, no layering — and the results could take you to another world, planetary or psychological. 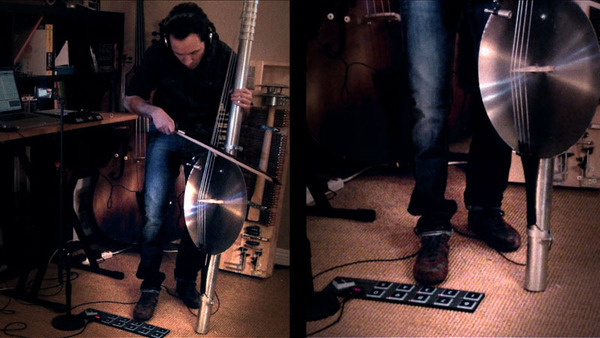 To make all the real-time performance work, Diego combined his Fence Bass with a Keith McMillen SoftStep for expressive live foot control and Ableton Live. I asked for a bit more detail. First, I definitely want to hear about the Fence Bass. How did you build this thing? Given that it’s your own invention, did it require any special practice or technique? After that occasion, I didn’t have a chance to continue exploring what I could do with the Fence Bass, but just a few days ago, I asked myself, “is there a way I can create a cinematic piece with one instrument in real-time?” So I started working on “Dustland” to figure out how to do it! I didn’t really take the time to practice anything in particular with the Fence Bass. Actually, I think that was a good approach, anyway, because the nature of this instrument is to produce edgy and aggressive sounds and effects, not clearly-defined bass lines. I like exploring an instrument with a naive approach, without thinking too much if there’s an appropriate technique or not. Finding the right foot controller has long been a challenge for artists. What was the experience like working with the SoftStep? I like the idea of having something that can also provide expression, not just stomp switches, but I’m curious to know if it held up in use. I had a carpet under my feet, so it was stable even when I was stomping on it. You can tell from the video that I wasn’t going easy with it! I found it a very interesting piece of gear, I liked the fact that for each Key I could program details like vertical range, sensitivity to pressure and response speed. Also, I needed to set a certain range for each key. For example, one of the tonal feedback needed to stay around -23 dB in order to sound good in the mix, and the cutoff of the filter needed to move from 1KHz to 9KHz maximum (the one on the distorted channel). I could easily do that by limiting the min and max MIDI value expressed by the key. The little display on the SoftStep is very useful, too, because I could watch the value without having to check the laptop screen. That, along with the programmable LED colors, helped me remember what I was controlling. How did you prepare your Ableton Live set so that this did all work live and real-time? To start with, I split the input signal into two tracks — one dedicated for the processing of low frequencies and the other for the highs. For this project, I used only one microphone through the Apogee One . The idea was to have more distortion when I was playing the first and second strings, and more tonal feedback and delays on the third and fourth strings. Then I created eight Return tracks, each one processing the sound in a specific way. For example, I had four different Beat Repeat [Ableton effect Devices] that feed into each other to create this sequences of beats that could continue as long as I wanted, activated independently from different keys of the SoftStep. One channel was the [Ableton Device] Saturator, where I was controlling the input signal and the cutoff, so I could go from a fat, filtered sound to a growling, distorted one. The SoftStep was the right tool for this project because I couldn’t use my hands to control a fader. But because the SoftStep recognizes vertical, horizontal, and pressure movements, I was pushing the tip of my feet down to open the filter and increase the input signal.